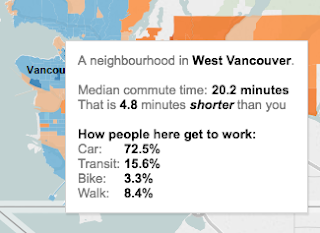 My latest data journalism project just went live on BC Business magazine's website: An interactive map that lets you compare your commute to neighbourhoods across Metro Vancouver. 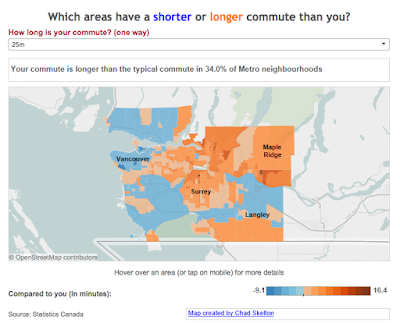 You just choose your commute time from the dropdown menu at the top and the map changes colour to show you which areas have a shorter or longer commute than you. You can also hover over any neighbourhood to get more info on how people in that area get to work. The map accompanies a feature story on commuting by my friend Frances Bula.